Persian Gulf is an extension of the Gulf of Oman. It is located between Iran and the Arabian Peninsula. It is estimated to have been formed around 15,000 years ago which makes this water body relatively young. It has a surface area of 251,000 square kilometers. Its name has been derived from the ancient Persia Empire. The world’s oldest known civilization also developed along the gulf. Here, temperatures are usually high but winters may be quite cool because it is close to the vast Arabian desert. 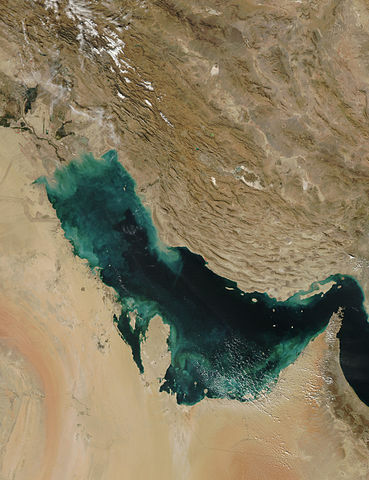 The Persian Gulf and its coastal areas are the world’s largest single source of crude oil. This region produces nearly one third of the world’s oil and holds over half of the world’s crude oil reserves. It is also home to Safaniya Oil Field which is the largest offshore oilfield. The gulf has several small islands including Bahrain, Greater Tunb, Lesser Tunb, Kish, Tarout, Qeshm Island and Dalma. The length of the gulf is 615 miles. Its maximum width is about 210 miles and minimum width is 35 miles. Its maximum depth is 330 feet and the average depth is about 115 feet. The gulf is home to more than 700 species of fishes and most of them are native to it. Oil was discovered here in 1908 for the first time but the major finds were made in the 1930s.